House and Senate committees register using the Statement of Organization, Form 1. A Form 1 must be filed within 10 days after the candidate designates a new committee as his or her principal campaign committee on the Statement of Candidacy (Form 2). The full, official committee name. The name of a principal campaign committee and any other authorized committee must include the name of the candidate. The committee’s email address. This is required for principal campaign committees for House and Senate candidates and for all committees required to file electronically. A committee may list up to two email addresses. The Commission sends courtesy reporting reminders and other correspondence to the email addresses listed. The committee’s website address, if one exists. On Line 2, enter the date when the committee officially became a political committee—that is, the date when the committee exceeded the registration threshold. On Line 3, enter the committee’s identification number. The FEC assigns each committee an identification number after the committee has filed a registration statement. This number is used by the FEC for computer indexing and is not the taxpayer identification number required by the Internal Revenue Service. Only committees that have previously filed a Statement of Organization should fill in this block with the number that was originally assigned to the committee. All new committees will be assigned identification numbers when the completed statement has been received, so a new committee leaves this field blank when they file the first Statement of Organization. Thereafter, the committee must enter the assigned FEC identification number on all statements and reports. The treasurer will sign and date the Statement of Organization at the bottom of the first page. 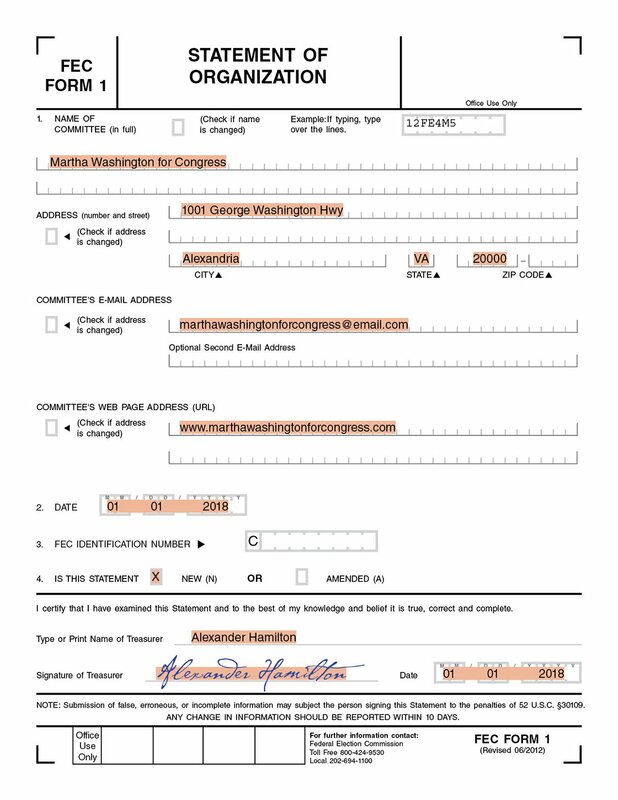 On the first page of the Form 1, Martha Washington for Congress enters general information about the committee, including its official committee name, address, email address, web address and the date it officially became a political committee. 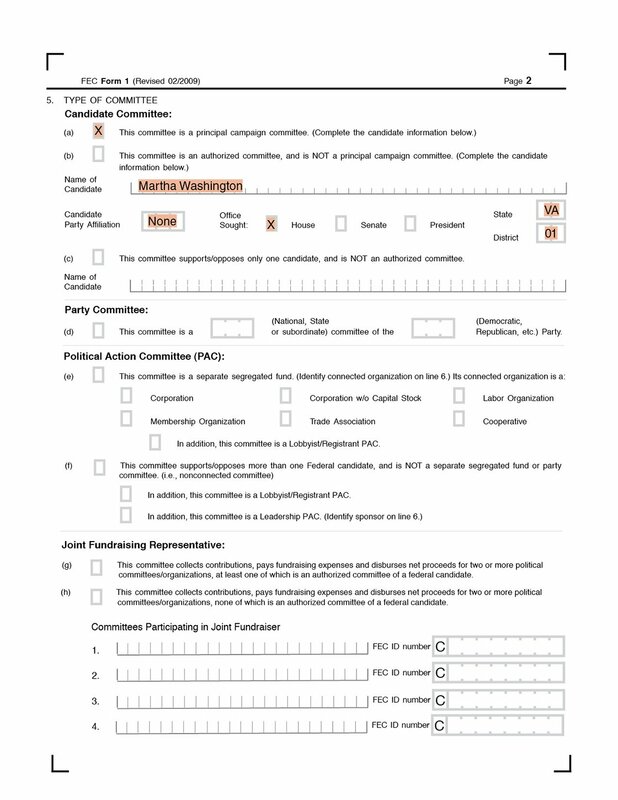 Martha Washington for Congress does not have an FEC committee identification number because it is a new committee. It leaves the FEC ID blank on this filing. Once the ID is assigned, the committee will include the FEC ID on all of its statements and reports. The committee also checks the "new" box on Line 4. The treasurer, Alexander Hamilton, signs and dates the Form 1 at the bottom of the page. On Line 5, select either principal campaign committee or other authorized committee. The committee should choose only one committee type. Martha Washington for Congress is the principal campaign committee for Martha Washington, and so the committee selected "This committee is a principal campaign committee." In addition, the committee includes information about the candidate and the race that the candidate is running in. Martha does not have a party affiliation, and so the committee entered "none." She's running for the House of Representatives in Virginia's first congressional district. 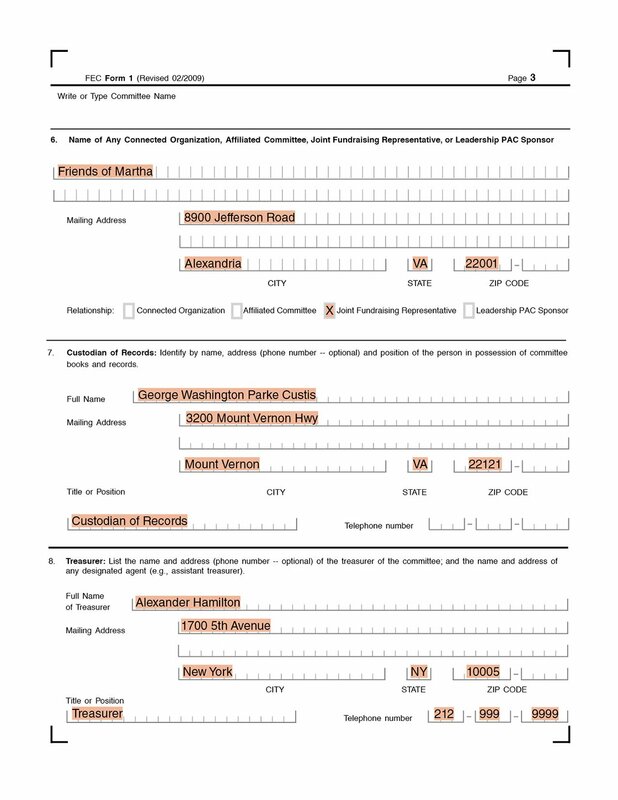 On Line 6, list the names and addresses of all other committees, including joint fundraising committees, authorized by the candidate as affiliated committees. Other authorized committees list only the principal campaign committee as an affiliated committee. On Line 7, enter the name, address and committee position of the individual who has actual possession of the committee’s financial records. The committee’s treasurer, assistant treasurer or another person (such as an accountant or bookkeeper) may serve as the custodian of records. On Line 8, provide the name and mailing address of the treasurer. Martha Washington for Congress is a member of a joint fundraising committee called Friends of Martha, and so they added the joint fundraising committee's information on Line 6. The committee checked the box indicating that Friends of Martha is a Joint Fundraising Representative. The committee designated George Washington Parke Custis as the custodian of records and Alexander Hamilton as the committee's treasurer. The committee included contact information for both committee officials. Line 8, which designates committee officials, continues on page 4. The Commission urges political committees to name an assistant treasurer, or “designated agent.” Only a registered assistant treasurer may sign reports and statements in the treasurer’s absence. depositories insured by the Federal Deposit Insurance Corporation, Federal Savings and Loan Insurance Corporation, or the National Credit Union Administration. On page 4, the committee has the option of appointing a designated agent. Committees are required to disclose its campaign depositories. 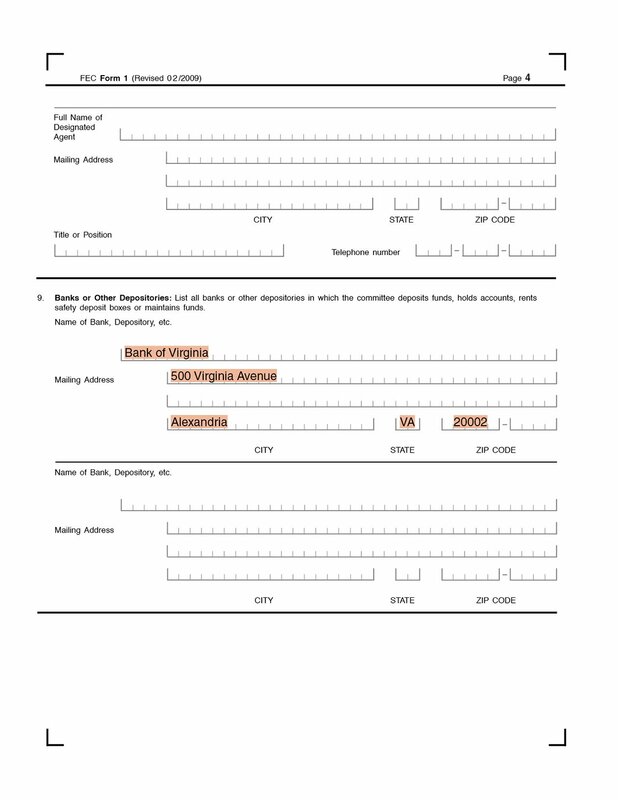 On Line 9, the committee listed the Bank of Virginia as its official depository and included the bank's address. A committee must report any change or correction of information contained in its Statement of Organization within 10 days after the change. A committee may have to file an amendment, for example, to report a new treasurer, a new assistant treasurer, a new e-mail address, a new joint fundraising committee authorized by the candidate, a change of address or a new campaign depository. The committee must indicate on Form 1 (or in a letter, if the committee does not file electronically) that the statement is an amendment to its registration. The amount of information required on an amended Statement of Organization depends on whether the committee files on paper or electronically. If the committee files electronically, submit a fully completed Form 1.